As per terms of offer advertised on ICICI bank website 15% discount [Screen Shot Available Here] was applicable on the purchases made with ICICI Bank credit card (goods value above Rs 3000). I made a purchase of Rs 5197.00 on 8-Nov-2013 from Benetton Store (Kids) Goregaon (east) Mumbai 400 063. Details: Tax Invoice No: CM No 496-11570 dt 8/11/2013 11:43 The store manager did not acknowledge the offer and asked me to write an email for same. After a continued communication from my side with the best intent to resolve the compliant, an offer was made by Benetton forcing me to purchase additional items in order to claim the applicable discount. No proper resolution has been provided in the last 60 days. I also suspect fraud being executed across the country by selling clothes for kids at inflated prices and luring customers with discount offers which are not provided on purchase. In the above case, the UC Benetton IT Systems were not equipped to handle the discount. Often, how this works is, the Credit Card Bank issues a Cash Back in the next billing cycle for the said amount instead of deducting at the time of billing. As a customer, you can also approach the consumer court in such cases but we’d advise you to avoid shopping if the offer is not being implemented by UC Benetton IT systems which is a sheer arrogance towards loyal customers shopping at such retail outlets. 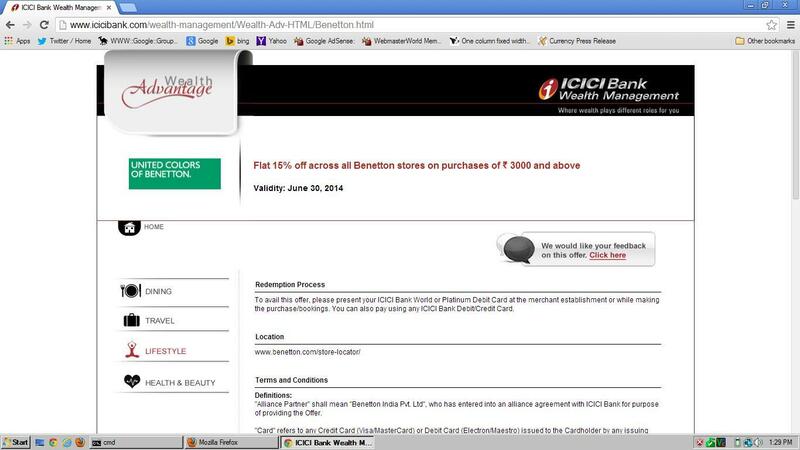 This entry was posted on Friday, February 21st, 2014 at 9:00 am	and is filed under ICICI Credit Card.